If you would like to support us but you're not sure where to start, you could join one of our events. 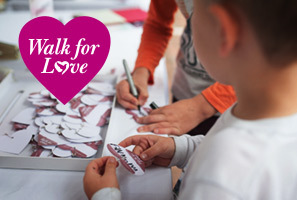 You are warmly invited to join our annual Walk for Love: honouring the lives, courage and memories of your loved ones, while helping to raise vital funds for patient care in Mary Potter Hospice. Donations to the Walk for Love ensure that patients and families can continue to experience Mary Potter Care, now and in the future. We would love to see you at the Australian Lutheran College, corner of Ward Street & Jeffcott Street, North Adelaide on Sunday 26 May 2019 at 10.00am. There is the choice of a 3km or 7km walk.